The limited numbers of women in scripture means we sometimes get caricatures of women—most frequently the angel or the devil. Women are either perfect, still, and silent on a pedestal or the garish whore of Babylon. Very few female characters in scripture are complex human beings, however, sometimes the nuance of a story shines through. Vashti and Esther are juxtaposed for us to make the devil and the angel comparison, yet a close reading of their narrative offers us much more (in addition to explaining the origin story of the Jewish holiday Purim). 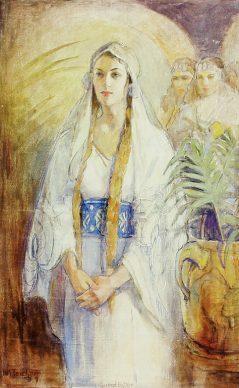 At the beginning of Esther’s book, we meet Vashti—the first headstrong and beautiful queen of Ahasuerus. As she and her husband held concurrent parties, she was summoned by the King. (Since women of the court could not appropriately attend the men’s party, she created her own.) Signaling both his wealth and ownership of Vashti, the king wanted to her to show off her royal gem and her great beauty to all the men attending his party. And she refused to come. She had to know the significant implications of speaking out and refusing her husband, yet she does it anyway—perhaps paralleling Esther later saying, “if I perish, I perish.” She refused him, and he was done with her. She lost her position as queen for ignoring his demand. The yes-men surrounding King Ahasuerus coddled him maintaining that he was supporting the authority of all men in their homes by removing the willful and mouthy Vashti from his presence permanently. Only because Vashti acted against the King is there a narrative for Esther. Esther’s narrative is set up with significant comedic elements that heighten the narrative. Initially, Mordecai is the origin of all action in the narrative—contrary to whose name is on the book. He vexes Haman by not bowing down before him. Prejudice kicking in, Haman realizes that he is a Jew and decides to punish Mordecai and all his people in a grand sweep of destruction. Mordecai convinces Esther that only she can save her people as he poignantly asks, “who knoweth whether thou art come to the kingdom for such a time as this?” (Esther 4:14). Esther acts affirmatively. She now has a mission. Even if she cannot see whether or not she will be successful, she knows this is God’s path for her. The only avenue initially open to Esther to influence the King is his visceral reaction to her—she hopes to “find favour in his sight.” (Esther 5:2 KJV ) Though we would hope to see Esther valued for more than her beauty, within the context the king seems incapable. Yet, as women throughout time, Esther used the “favour” found for a purpose. In this instance, she adopts the purpose suggested to her by Mordecai to the benefit of all her people (and to the detriment of Haman). The tension builds between Haman and Mordecai in farcical ways—everything Haman does is the height of irony. Moreover, the irony also applies to Esther. She now plans a party as did Vashti—rather than being the perfect submissive and silent opposite of Vashti, she adopts Vashti’s playbook to manipulate the king. In contrast to Vashti, she is successful. Esther is able to step outside of the role of the beautiful object to an autonomous subject capable of initiating action and saving her people. Like Esther, women throughout history have used the authority given them by the Holy Spirit to move beyond the sphere expected of them. Esther and Daniel both fit into the same genre. Though separated within the biblical text itself, they both offer different tales of royal courts and courtiers and as such offer much for us to consider about our relationships with earthly power and the power of God—especially within our own current politically charged context. Both books lead us to consider those in power and the fallibility of humans. The biblical text does not treat these leaders as infallible beings divinely invested with power and owed allegiance by their subjects, but royalty as very human beings—sometimes capricious, gullible, easily manipulated, and rarely worthy of trust. None of the main characters of these narratives can see the end from the beginning, but they still choose God even if it means their own earthly destruction. Their humility precludes any arrogant assurance that God will spare them. Esther does not expect that she would be successful where Vashti failed, she is prepared to perish. Daniel does not expect to make friends with the lions, but he still prays. Shadrach, Meshach, and Abed-nego are willing to give up their lives in the fiery furnace, they will not worship an idol. All of them know that God can save them—”Our God whom we serve is able to deliver us from the burning fiery furnace.” But they do not expect that “he will deliver us.” Their decisions are not shrouded in certainty—“But if not…” But even if they perish, they will remain faithful (Daniel 3:17-18).